Late arrivals: contact us if you will be arriving later than 9:30 p.m. The Hostal Patria, in downtown Madrid, has one of the best locations in the city. The Puerta del Sol is just a few metres down the Calle Mayor from our front door, and the Teatro Real opera house, the Plaza de Oriente, the Royal Palace, the Almudena Cathedral and the Sabatini Gardens are also within easy walking distance. 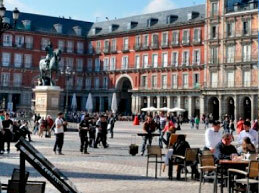 The Plaza Mayor, where you can have a meal, a drink or coffee on one of the many open-air terraces, is perfect for enjoying Madrid´s special ambience and joie de vivre. You can also stroll through the nearby La Latina neighborhood where the famous Rastro flea market is held every Sunday morning. Calle Preciados, a bustling pedestrian shopping street full of activity, is just 5 minutes from the Hostal Patria. It runs from the Puerta del Sol up to the Gran Vía, where you can take in a top-class musical. Calle Fuencarral is just off the Gran Vía and has the best shops for trend-setting fashions. Chueca, the centre of Madrid´s gay district, is located just off Fuencarral and is full of clubs and bars where you can enjoy the city´s nightlife. If you like, you can also visit the nearby bohemian Malasaña neighborhood. Hostal Patria´s excellent location right in downtown Madrid makes it easy to walk to the “Art Triangle” or “Golden Triangle” district where the city´s most important museums, the Prado, the Reina Sofía contemporary art museum or the Thyssen Bornemizsa museum can all be found. 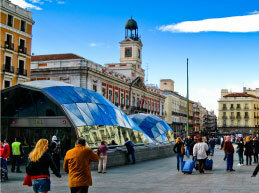 The Puerta del Sol is the neuralgic centre of the city. Since 1950 the so-called “0 km. marker” for all of Spain´s radial national highways has been located here. The origins of the Plaza Mayor date from the 16th century when it marked the junction of the Toledo and Atocha roads, on the outskirts of the medieval city. Nowadays these roads are the Calle de Toledo and the Calle de Atocha. On this site, which at the time was known as the “plaza del Arrabal” or the square on the outskirts of town, Madrid´s main market was located. The first house with an arcade was also built at the time. 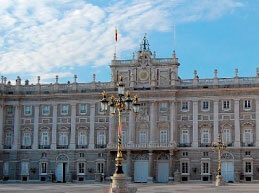 The Royal Palace is the King of Spain’s official residence, although he does not live there. The Palace is used primarily for state ceremonies and receptions. The King and Queen of Spain and their family reside in the Zarzuela Palace. The Holy Cathedral of Santa María la Real de la Almudena is the Episcopal headquarters of the Archdiocese of Madrid. 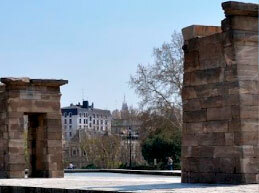 The Debod Temple is an ancient Egyptian monument that was shipped piece by piece to Madrid and reconstructed. It is located to the west of the Plaza de España, next to the Paseo del Pintor Rosales, on a hillside where the Cuartel de la Montaña military barracks used to be. 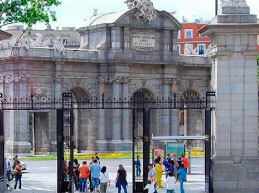 The Puerta de Alcalá is one of the five ancient royal gateways leading into the city of Madrid. 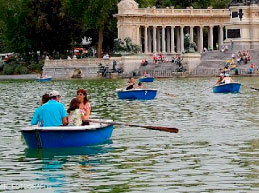 This park is popularly known as simply “El Retiro”. It´s 291 acres of greenery, located in the midst of the city, make it one of the most important sights to see in the Spanish capital. 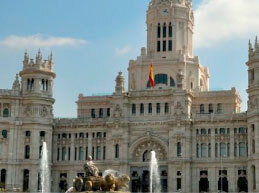 The Plaza de Cibeles is the most famous square in Madrid. It is actually a large roundabout connecting two of the city´s main thoroughfares. The Real Madrid and the Spanish national soccer teams celebrate their victories in the Cibeles fountain.